Due to a weather delay, my mother and I left Wednesday instead of Tuesday to visit my brother, Danny, in Pittsburgh. He had surgery on his meniscus at 4 am the following day. He currently has to keep his knee at 180 degrees, so I am the one to take care of his two 4 month-old puppies. He heard that he needed to get the surgery 4 days after he got the puppies. At least they are adorable. 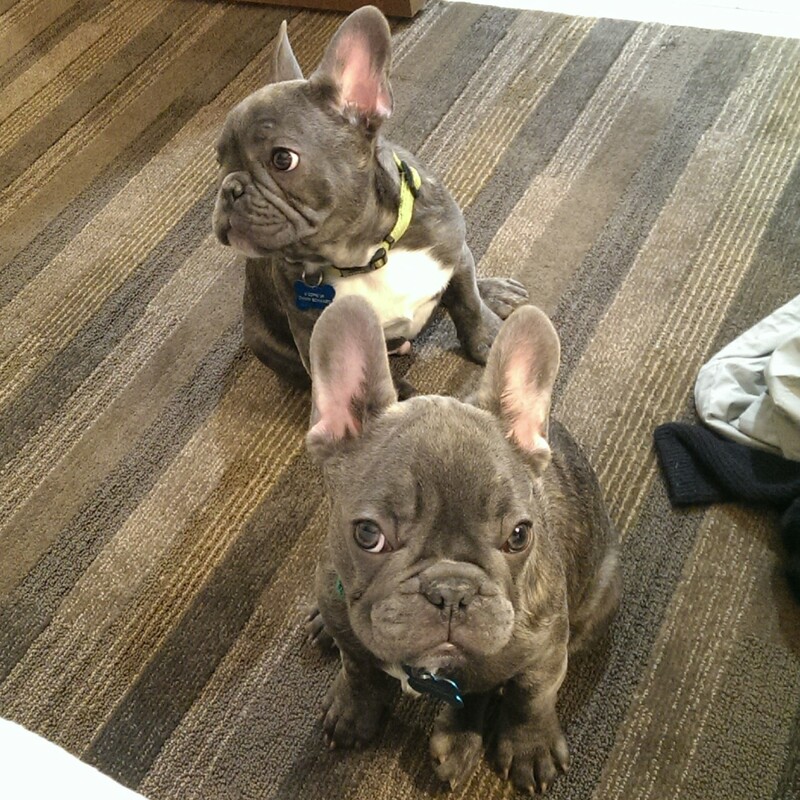 Danny’s French Bulldogs, Pudge (left) and Mojo (right). On that Friday, I met my mom’s cousin Judy (Mama Trudy’s sister’s daughter). 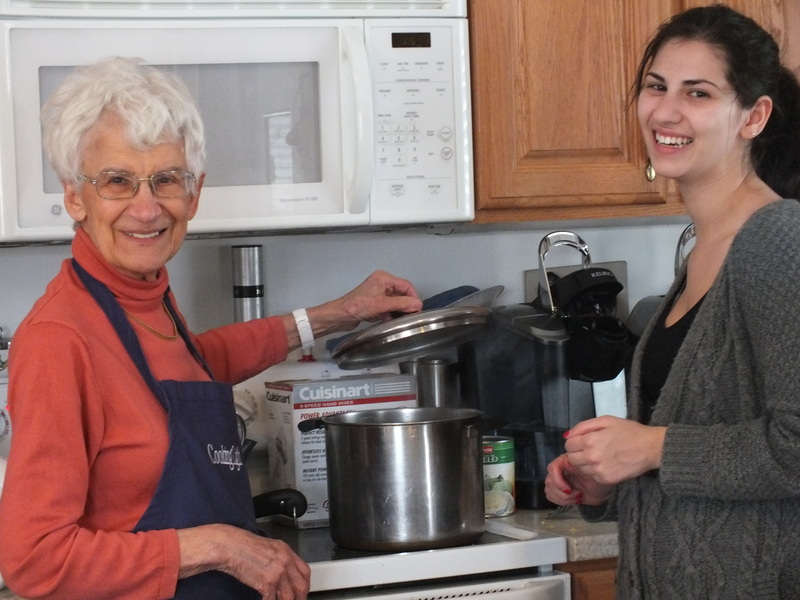 She will be sending her mother, Anne’s, potato kugel recipe and pictures soon! My mom, Danny, Pudge, Mojo, and I went to State College Saturday to see Mama Trudy and Papa Sam. Danny and his puppies will stay at their house until the end of the month when he will hopefully well enough to go back to Pittsburgh. I think he’s doing pretty well so far- I am just happy he has his puppies to keep him company. 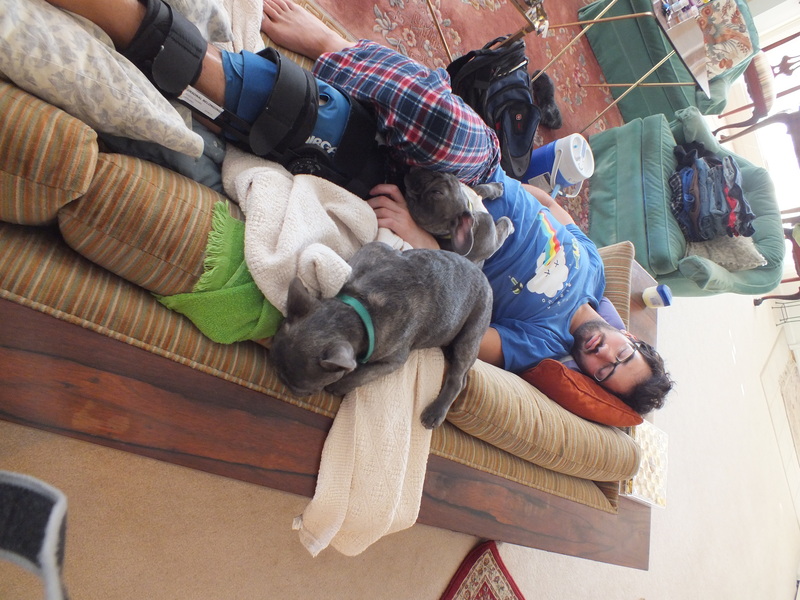 Danny (with his knee brace) sleeping with Pudge and Mojo. When I got to State College that Saturday, I showed Mama Trudy, Papa Sam, and Aunt Renee (my mother’s older sister) my poems I wrote about Mama Trudy’s family a week or two ago. I have tried posting them here for over an hour but the website appears to just not want to have my poems. They all really enjoyed my poem, and we ate Mama Trudy’s homemade brisket with mashed cauliflower right after. 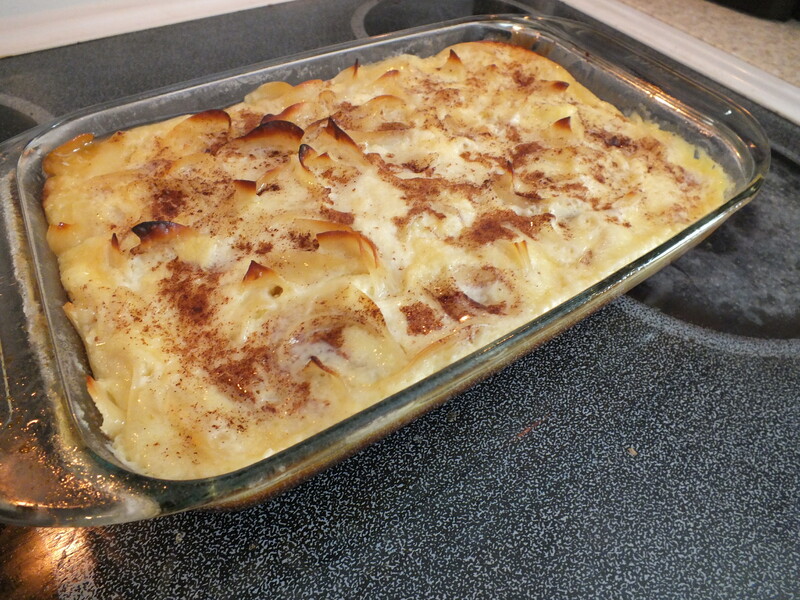 On Sunday (yesterday), Mama Trudy and I started off the day making noodle kugel. And then after that, we made carrot soup. Here is a picture of Mama Trudy and I making it. 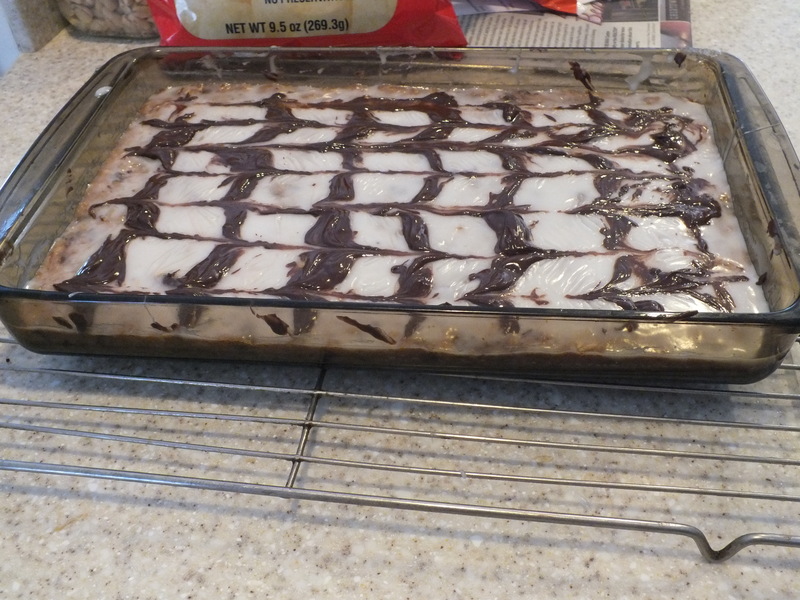 My mom has been raving about this chocolate dessert Mama Trudy would make all the time when she was little. Her and Renee would always eat them frozen because they were too impatient to let them defrost. We found the name Petites Four Squares, and made them too. After following each direction to the letter, it tasted exactly how my mother remembered it. 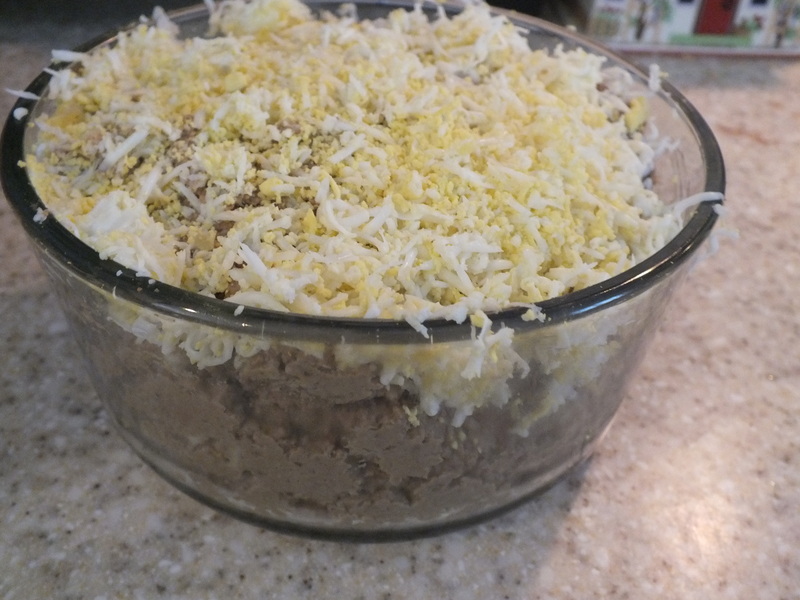 We also made “liver pâté,” but we all know it’s just chicken liver ground up with onions and garlic. That is not my favorite, but here is a picture of it anyways! 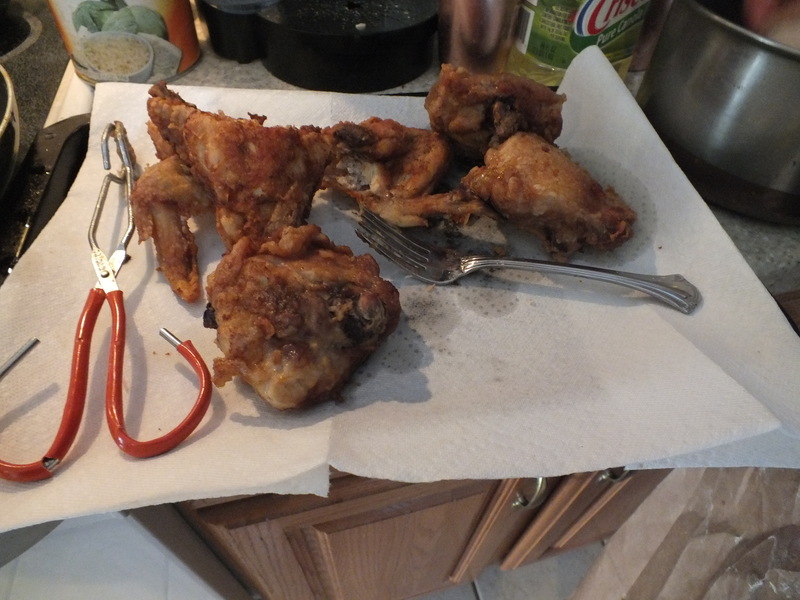 After that, Papa Sam made his Southern fried chicken. He learned how to make it when he was growing up in Saltville, VA. He hadn’t made it in over 50 years! Mama Trudy told me that he didn’t make it in so long because he would always make a mess, getting grease on the floor, the counter, and even the ceiling! 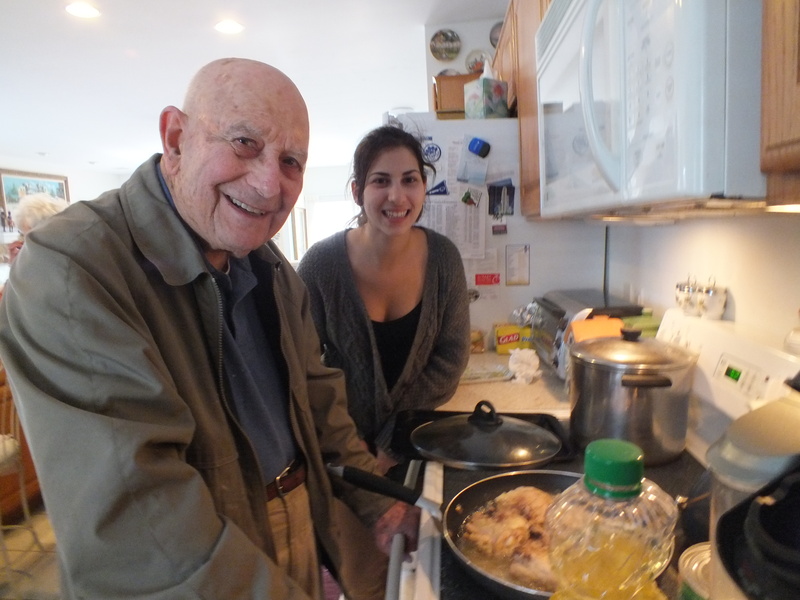 Papa Sam and I cooking up some fried chicken! When we were done, Mama Trudy said that he was much neater making it. And it tasted delicious. I will probably be updating you frequently from now on. We are making strudel and stuffed cabbage soon! I gotta go! It is going to be a busy couple of weeks!